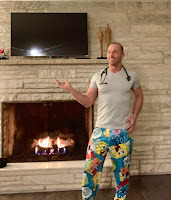 I can't pinpoint the moment exactly, but several years ago I began to notice that many of our ER patients were presenting for treatment wearing nice fluffy fleece bottoms. Men. Women. Old. Young. These fleece bottoms seemed to be enjoyed by a variety of the population. Most of these earlier bottoms for the younger patients were of superheroes and childhood figures, like kitties and ponies. For the older patients, it seemed like the characters from the adult-cartoons The Simpsons and The Family Guy were a big hit. Being a new sort of fashion, I enjoyed the earlier era of these pajama bottoms. They seemed to be appropriate wear for some of our sicker patients who didn't have the energy to change out of their bed wear before coming to us for medical help. Especially the kids, who often had matching fleece blankets, I enjoyed the style of these pajamas and the apparent comfort they seemed to provide. In no time, though, it seemed like these pajama bottoms began to be worn not only by the patient, but by family members. Little Sally, who was brought to our ER by her parents for vomiting and diarrhea, was not the only family member wearing cartoon pajama bottoms. So were Mom, Dad, and her older brother. "Little Pony is my favorite!" she exclaimed to me. I wonder if it was Mom's favorite, too, since she bore matching bottoms. It all made some sense, though. It was 10 pm and everybody was probably either getting ready for bed or in bed when the decision to bring Sally in was made. I should have gotten more suspect of this trend, though, when over the next few weeks to months, more and more people began showing up wearing fleece pajama bottoms. Even moreso, they were being worn sometimes not by the patients, but rather by their supportive family and friends. There sat Larry in his hospital bed, with chest pain and difficulty breathing, being supported at bedside by his adult son and daughter as well as his grandson. The grandson, of course, looked handsome in his wind pants and sweatshirt. His children, however, looked less put-together--his son wearing Steeler fleece PJ bottoms while his daughter's were plastered with Lisa Simpson's face. At 2 pm. On a weekday. In the summer. With abundant sunshine outside. Of course, Larry was lucky to feel the love of his family at bedside, regardless of their attire. The bigger picture wasn't lost on me. Yet, it was interesting to see the fashion pendulum swinging into an area where fleece bottoms were becoming acceptable wear at all hours and in all weather. Although I initially thought so, I can't say that this trend is related to economics. Recently, at Walmart, we discovered a whole array of very cool, bright patterned fleece pajama bottoms. Cartoon characters, Marvel superheroes, sporting team emblems, camouflage, even imitation Burberry plaids--the selection was impressive. And the cost? $11.96 for the cheapest bottoms. And the rack next to them? Sweat pants for $6.00. Over the last few years, then, it has become common practice in our ER to treat people of all ages, from all walks of life, in all weather, in all type of medical emergency scenarios, wearing these bottoms as a staple to their outfit. It seems like Stewie Griffin's big bald baby head on PJ bottoms can go with a nice pair of boots and a cable-knit, turtleneck sweater on a middle-aged woman. SpongeBob bottoms go great with a Dallas Cowboy t-shirt and a John Deere ball cap on a college kid. And Hello Kitty--well, Hello Kitty can pretty much write her own ticket to all the various outfits she ties together. She even purrs when paired with a half shirt that says "Who needs brains when you have these." Yes, I am being serious. 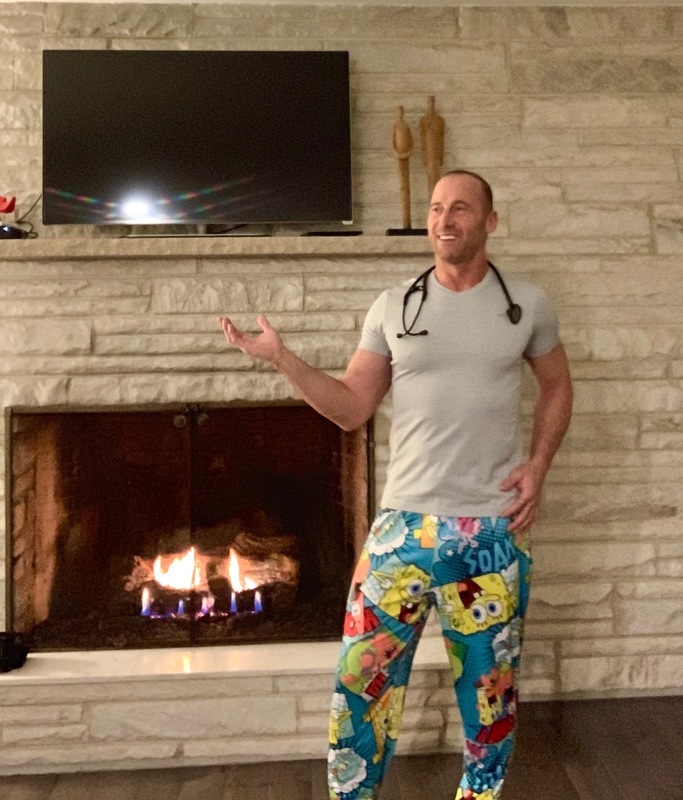 Not only were these PJ bottoms being worn by patients and their families in our ER, but it seems that these fleece PJs are now a staple in public as well. Recently, I was in line at a local market during midday. Fourth in line at the check-out. And as I was assessing how long my wait would be, it suddenly struck me that the three people checking out in front of me were all in fleece pajama bottoms. The person in front of me, unfortunately, smelled and looked like he had just rolled out of bed. His hair was matted and greasy; his body smelled of yesterday's stale fart. It seemed as if his lack of effort to shower and be presentable in public was excused by wearing his Batman PJs in public. Being an eternal optimist, I was hopeful he was just delaying his shower until after he got his filet mignon cooking on the grill when he got home. Oh wait! I don't recall any PJ bottoms on the red carpet while watching the highlights of the recent Oscars. Did I miss something? Maybe Glenn Close should have skipped her designer gown for a pair of Wonder Woman fleece bottoms. With Christian Louboutin heels, of course. I have seen people do double takes to get a second glance at some of the people wearing the newest PJ fashions. When the PJs are clean, they don't look so bad. When they look like they haven't been washed in two weeks, well...second glance deserved. And when they stink like they haven't been washed in two weeks, a wrinkle of the nose is just as well-deserved. I can only imagine what our grandparents would say about this fashion trend, what with the strict dress code they had when they were growing up (some even in desperate times). "Heck," I heard an elder physician at work exclaim recently when complaining about this trend, "if I ever went out in public like that, I wouldn't have ever seen the light of day again. What has happened to people?" I guess at this point most of us are immune to the trend. Accepting of it. I do appreciate some of the eye-catching outfits that involve these PJ bottoms. Some of the designs and patterns are hip. And I appreciate the surprise factor of people wearing them, still. Of their courage, or maybe it's their apathy, of wearing them in public and incorporating them into their everyday wear. And let's be honest, it's kind of cool to see the same design being worn by an infant, her mother, and her grandmother at the same time. As I said before, and I'll say it again, I love my job and my patients. For so many reasons. After all, where else would I get to meet an attractive, sophisticated, gray-haired elderly woman wearing a trim blouse with concise lipstick and well-placed rouge...and fleece pajama bottoms with marijuana leaves patterned on them. "I just love my hibiscus plants," she explained. As always, big thanks for reading. Feel free to repost the essay and share your thoughts. This cheeky post was written after a long stretch of rough shifts.